The Start somewhere, go anywhere report was written by Caron Menashe, Senior Community Relations Officer, Anti-Discrimination Commission Queensland and Enda Cotter Coordinator, Community Engagement Anti-Discrimination Commission Queensland. Use the Table of contents to access sections of the report, or Download the Start somewhere, go anywhere report as a print-friendly file (PDF File, 607.7 KB) . reflect on some of the challenges in this approach. 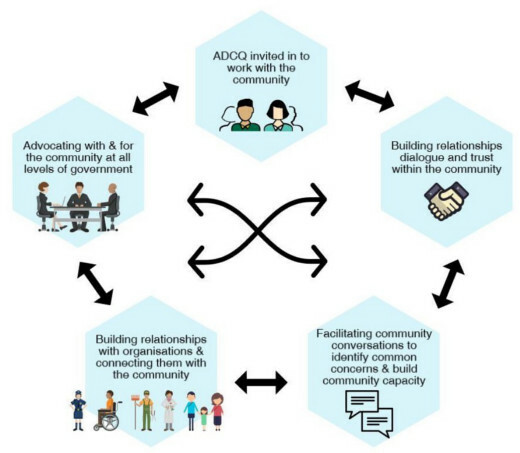 In 2012, the Anti-Discrimination Commission Queensland developed the ADCQ Community Engagement Strategy to help us implement a strength-based approach to our community engagement work. The strategy provides a framework for how the ADCQ will work with community, business, and government to raise awareness of human rights and build opportunities for people to become involved in the Commission's vision of building a fair and inclusive Queensland. Previously, much of the ADCQ's community engagement work involved raising awareness of people's rights and responsibilities under Queensland anti-discrimination law, and of the functions of the ADCQ , through short-term activities such as education programs, ADCQ events, information stalls, and distribution of information resources. The new strategy provides scope for a broader community development approach to our engagement work that aims to empower communities to work together towards a fair and inclusive society, by helping them recognise and build on their existing strengths and capacity for collective action. In 2013, the ADCQ decided to apply this approach in a long-term engagement strategy in the Lockyer Valley, following an invitation from the Lockyer Valley Regional Council Multicultural Project worker and Humanitarian Settlement worker to work in partnership to address issues of discrimination occurring locally. Three years of intensive work with the Lockyer Valley community has enabled the ADCQ to build strong relationships with the community and key stakeholders, to connect the community with those key stakeholders, and to help them work together to tackle some daunting human rights concerns. In the process the engagement strategy has produced some significant positive outcomes, some of which could not have been foreseen at the start of the project. This report aims to share some of the stories of those three years with other organisations, and to encourage them to consider taking similar approaches in their community engagement efforts. In 2012, the Anti-Discrimination Commission Queensland developed the ADCQ Community Engagement Strategy to help the Commission implement a strength-based approach in our community engagement work. The strength-based approach in ADCQ community engagement work focuses on identifying and developing the strengths of individuals, organisations, and communities, and empowering them to address human rights issues locally through their own collective efforts and abilities. This approach is an alternative to more commonly used problem-solving approaches that identify issues from the outside and impose externally-driven interventions. In contrast, the strength-based approach starts from the premise that communities have capacity to identify their own concerns, and the ability to work together to resolve them. Using this approach, the ADCQ aims to actively identify and support the existing capabilities of local individuals and groups, and work with them to achieve positive outcomes, and create spaces where human rights can flourish. The strategy encourages ADCQ staff across all teams to work together on strength-based projects. –Communities can be empowered to identify and address their own issues. – ADCQ's role includes creating safe spaces for local communities to raise awareness of issues that need to be addressed in order to build an inclusive community. –Energy and capacity to drive change exists in every community. Opportunities to be involved and contribute should be available to the whole community. Building relationships is the key to creating capacity in the community to drive sustainable change and action. the public concerns raised by the community within those phases, and how we worked with the community to try to resolve them. Throughout the report, stories will play an important part in illustrating the elements above, and will include stories from the Lockyer Valley community members involved along the way; Anti-Discrimination Commission Queensland officers working intensively in the area; ADCQ management who supported the Strategy; and stories from workers in external organisations that we worked with. MSC is a comprehensive technique developed to monitor changes in a complex, open-ended, rural development aid project in Bangladesh involving over 500 staff working in 785 villages. While we determined that the multi-level, systematic selection of the most significant change stories was not suitable for evaluating our Community Engagement Strategy, we agreed that collection of stories from various stakeholders would tell us a lot about what (if any) difference our work has made. Fieldworkers write down unsolicited stories that they have heard: Mostly, there were two Anti-Discrimination Commission officers working in the field in Lockyer Valley during this project. We have included their stories where we feel that they demonstrate a significant progression or change. Members of ADCQ senior management involved also provided stories of crucial support for the project. By interviewing and note-taking: We used this method firstly to gather stories from the key community members we engaged with, and secondly as an alternative to the group discussion method described below when people were unable to attend, or were reluctant to share their story in a group environment. We asked additional ADCQ officers to be available for face-to-face or phone interviews to record stories. These officers also attended group discussions to take notes and collect stories. During group discussion: With the aim of generating a free and open a group discussion, we asked two key Lockyer Valley stakeholders who had been intensively involved in the project throughout to facilitate this process. As described above, we asked other ADCQ officers to attend and take notes. The beneficiary writes the story directly: Finally, we asked those same ADCQ officers to be available to people by email or post, to collect their stories. While we believe that the qualitative data reveals much more about the impact of the Community Engagement Strategy than the quantitative data, it is also important to provide a record of the activities we initiated, or participated in, as well as the numbers and types of local stakeholders we interacted with during those activities. We have recorded these activities chronologically through the phases of the project, because the nature of the activities often demonstrated and contributed to its evolution. For example, the first community conversation held in August 2013 had 10 local participants, whereas the second one held in November 2013 had 72 local participants, many of whom were there because they had heard about the first conversation and asked for a second. These numbers in themselves tell a story, but the real stories behind them (the qualitative data), provide a much richer understanding of why the numbers are significant. The Anti-Discrimination Commissioner and Deputy Commissioner, as well as the Director, Community Engagement have all been involved in various elements of the Lockyer Valley Community Engagement Strategy, and therefore have been instrumental in many of the outcomes and are very aware of its impact. Throughout the project, on each distinct project area, we have kept them informed of any major developments that they were not already aware of, or involved in. The large amount of available written material and the collective knowledge have provided more than sufficient data for the senior management team to assess the Strategy in order to determine to what extent it has contributed to the goals of the ADCQ's Strategic Plan — particularly the goal of promoting a fair and inclusive Queensland . The many positive outcomes of the Lockyer Valley Strategy have enabled senior management to determine that the strength-based approach to community engagement, whilst being far more time consuming that a more standard approach, can contribute to significant concrete outcomes for communities, and has. This helped the ADCQ to secure a full-time Coordinator, Community Engagement position to continue similar work in other regions of Queensland. 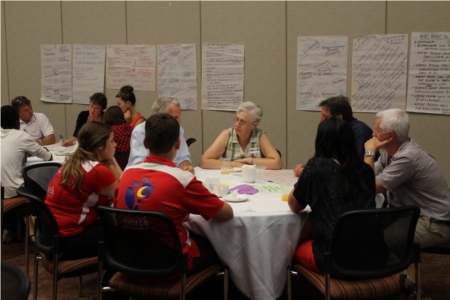 In order to hear from the Lockyer Valley community about whether and how the project has made any difference to their region in terms of empowering the community to begin to work together towards creating a more fair and more inclusive society, we collected their stories and facilitated a conversation in 2015, hosted by ADCQ workers who had not previously been involved in the Strategy. Most tellingly perhaps, our relationships with many of these key stakeholders are still very strong and we continue to communicate regularly on the issues as outcomes continue to unfold. The ADCQ's involvement with the Lockyer Valley community began with a standard community engagement approach, focused on raising awareness of people's rights and responsibilities under anti-discrimination law. We were then invited in to engage further with the community to help them address local issues of discrimination, and create a more fair and inclusive community in the Lockyer Valley. We began to hold facilitated community conversations and meetings on this topic, but found that people regularly raised other concerns as well, such as poor conditions of employment and accommodation for seasonal farm workers, and the lack of formal English language tuition locally. Mostly these were not concerns that could be dealt with under anti-discrimination law, but the community was asking what the Anti-Discrimination Commission could do to help them with solutions, especially when it required the involvement of other government agencies. We asked ourselves the same question, and came to the conclusion that, if an issue involved human rights concerns relevant to the Anti-Discrimination Commission Queensland's strategic vision of promoting a fair and inclusive Queensland , we would bring it into the scope of the project, and explore avenues for dialogue, conversations, and connections that could lead to solutions — at both community and government levels. As a result, the The ADCQ's approach to community engagement in the Lockyer Valley evolved into a more comprehensive community development approach that we call Start somewhere, go anywhere . On every visit to the Lockyer Valley for community engagement activities, we found ways to meet more people, build more relationships, and have conversations that in due course identified issues of common concern, such as those described above. These interactions led to further activities focused on the concerns and aspirations expressed by the community. In line with the aims of the ADCQ Community Engagement Strategy, The Lockyer Valley Community Engagement Strategy was built on the strength-based approach described earlier, and provided a framework for how the ADCQ worked with community, business, and government to raise awareness of human rights in the Lockyer Valley, and, most importantly, to create opportunities for people to become involved in the ADCQ's vision of promoting a fair and inclusive Queensland. identify opportunities for longer-term community development work that could build community capacity by helping develop existing strengths and capabilities to address local human rights issues. ADCQ staff used a range of community engagement methods. information stalls at events or particular locations. actively connect stakeholders from different organisations and regions with each other. working with external organisations to plan and implement activities to help address these concerns at the government level. Building resilient communities that can support themselves is crucial in today's society in which governments are called on to deal with increasingly complex social issues and needs. Facilitating a participatory community development process can help communities meet challenges in cooperation and collaboration with government, and achieve shared objectives characterised by community ownership. enabling the community to identify common human rights concerns and take collective action to address them locally. We believe that these elements, which are evident through all the phases of the project, are the reason for its success. encourage collective community action (mezzo method). facilitating connections between these organisations and the community, either through individuals or facilitated group processes (macro method). –advocating with, and on behalf of, the community at all government levels for legislative, policy, and procedural changes (meta method). It is important to note that the phases of a community development process such as this are not linear. Instead, they are usually cyclical in nature with many activities repeating or continuing throughout the process. unfair and unsafe conditions in accommodation for seasonal farm workers. Community development literature identifies many different dimensions of community development practice; however some dimensions apply across most practice frameworks. A good entry into the community and a good beginning lays a strong foundation for community development. How, and by whom an outsider is introduced, and who they engage with, will significantly affect the quality of their work and the outcomes for the community. Workers need to spend time getting to know people in order to: understand cultures, power relations, and community interests; build trust with all groups (whether marginalised or in leadership); and to gain acceptance so as to work effectively with them for their community development . Workers also need to set aside their own agendas to focus on what the community identifies as its most urgent needs. This will open a gateway for further community development work . The elements of awareness-raising and capacity building should go hand in hand and result in empowerment of people . If awareness-raising only informs or educates in a way that worker appears to know everything , it can undermine the dignity and knowledge of people in the community. If, in contrast, it is a mutual learning experience, it can empower people to realise and build on their strengths. As a community development strategy, awareness-raising should help the community gain critical consciousness of their situation, develop faith in their ability to think of ways forward, and translate that into action for change. It should create hope and independence, enhancing the capacity of people and organisations to realise human rights by helping them recognise and build on their skills, knowledge, and ability to transform their own societies. Sustainable community development: continuity and self-governance / management Sustainability in community development refers both to sustainability of resources, and of community development activities. In terms of resources, it is about responsible management of finite resources so that everyone, including the most disadvantaged, can access them now and into the future. The dialogical community development approach stresses the importance of starting with the needs and resources of the people, and of building and facilitating relationships with and within communities to enable individuals and small groups to participate in shaping their own development. However, the building of relationships in itself is not community development. Kelly et al state that Community development is a purposeful activity — the purpose being to bring people together with the aim of collective action. Westoby and Owen emphasise that the principle of true dialogue , as expressed by Buber (1923), is critical for the success of the dialogical method in building developmental relationships. True dialogue requires that we are truly present when we introduce ourselves to another person, in order to be genuinely attentive and listen to what is being said in response, and finally, to respond to them in a way that connects with what has been communicated to us. This is reflected in Pawar's second dimension of making a good entry into the community and establishing a good beginning. We will only be able to hear and focus on what the community identifies as its most urgent needs, if we set aside our own agenda and are truly present when we engage with others, so that we can connect with what they are saying to us. At the outset, the Lockyer Valley Strategy focused on raising awareness of discrimination issues, and on helping people work together to create a more fair and inclusive community, so the initial facilitated community conversations and meetings focused on this topic. It soon became clear however that a number of other concerns were also being regularly being raised, namely poor conditions of employment and accommodation for seasonal farm workers (including sexual harassment) and the lack of formal English language tuition locally. While these were not issues that could be dealt with under discrimination law (apart from sexual harassment), we came to the conclusion that the community was asking for help on human rights issues relevant to the ADCQ's strategic vision of promoting a fair and inclusive Queensland . The new ADCQ strength-based approach, together with our community-driven practice framework of Start somewhere, go anywhere , enabled us to bring these issues into the scope of the project, and explore avenues for dialogue, conversations, and connections that could lead to solutions — at both community and government levels. Note: In these four project stories real names have not been used in order to protect the privacy of individuals. In June 2012, the ADCQ Community Relations Manager visited the Lockyer Valley hoping to meet with the newly-appointed Multicultural Project Officer (Local Area Multicultural Partnership, or LAMP worker) at Lockyer Valley Regional Council. However, the LAMP worker (Magda) was away from the office, so the Community Relations Manager left her contact details and some brochures. Sometime later, the LAMP worker together with the Settlement Worker based at Council (himself a member of the local Sudanese community) arranged a community information session for local African communities. Following this session where many issues came up but a strong one was segregation and bullying in the workplace the LAMP worker emailed the ADCQ Community Relations Manager requesting an anti-discrimination workshop in the Lockyer Valley for migrant and refugee groups. In November 2012, an ADCQ Community Relations Officer delivered a workshop in Gatton on the Queensland Anti-Discrimination Act for members of the Sudanese community, organised by the LAMP worker and the Settlement Officer. Participants related many local, serious incidents of racism, discrimination in relation to work, community safety, housing, and social events, as well as widespread incidents of racial vilification. At the end of this workshop, and due to the apparent widespread nature of the issues raised, the LAMP worker and the Settlement Officer said that they would like to continue to work with the ADCQ on local community engagement initiatives. Their wish was to raise awareness amongst local businesses and the community of the discrimination issues expressed at the workshop, in order to improve opportunities and quality of life for local migrants and refugees. The whole thing started when I was working with the Settlement Officer. It seemed there was discrimination in the community, so we decided to ask the ADCQ to provide an information session. It would be an opportunity for people to be heard, and to take information back to their communities in their own language. Six or seven men from the Sudanese community attended, who each had a story about discrimination. This highlighted to the ADCQ officer that there was a need for some serious work. She was committed from very early on to doing something to help, and the rapport she built was very important. This first session was heart wrenching and set us on a path together. The program took some months to develop, but the ADCQ officer was the real strength; she had a great community development approach and spent a lot of time out here meeting people. A classic example of a true and honest conversation was on a park bench with members of the Darfur Association, where we heard about their urgent need for English classes. In my role it was easy for me to support the work of the ADCQ. I asked the Commission to come out to the Valley and they were on board from day one. The lead time for the first community conversation was short so numbers were low, but that meant that participants were able to discuss the topic in detail. It raised awareness of the breadth of community issues and created interest in the second conversation. Both conversations led to further activities about English tuition and farm worker issues. Now in my voluntary position, I keep contact with the Commission, have many connections with people working on lots of different issues, and can share my greater awareness with the broader community. I think we are where we are due to the relationship and commitment of the ADCQ officers. They were here at festivals, raising awareness, and engaging the community in various ways. They were very good at building and keeping up connections, and working out how they could work with different people and groups. As a result of the invitation from Lockyer Valley Council workers to work in partnership, and because of the apparent widespread human rights concerns raised by the community, the Community Relations Officer, in consultation with the ADCQ Commissioner and the Community Relations Manager, drafted the Lockyer Valley Community Engagement Project Plan. The ADCQ Commissioner believed this would be a good opportunity to put into practice the new ADCQ strength-based approach to community engagement, and to encourage a more proactive approach to promoting human rights in Queensland. He approved the plan. The ADCQ Community Relations Officer then began to discuss with the LAMP worker how the ADCQ could support her work and the community. These discussions led to the ADCQ being invited to deliver two more community information sessions in Gatton, organised by the LAMP worker, and to exhibit at a number of local community festivals. These were fairly standard community engagement activities for the ADCQ, but the turning point came when the ADCQ Commissioner was invited to Gatton to give a presentation on the NDIS. He suggested to the ADCQ Community Relations Officer that there would be a good opportunity after his NDIS presentation, to facilitate a world café-style community conversation around the ADCQ's vision of promoting a fair and inclusive community . What are the barriers to inclusiveness in our community? What can we do to create more opportunities for meaningful participation for all members of our community? The discussions raised issues such as a lack of understanding about difference leading to fear and stereotyping, a lack of support and services for marginalised groups, and various barriers to employment and social engagement for these groups. Most importantly, they enthusiastically put forward ideas about how the local community could work together to address some of these issues. These were familiar topics for the ADCQ, but participants also raised specific concerns about issues that weren't so familiar — the lack of formal English tuition in the area in recent times, and poor accommodation facilities for seasonal farm workers. Word spread locally about the community conversation and people began to email the LAMP worker asking if another one was planned. As a result, she invited the ADCQ Community Relations Officer to attend the Lockyer Valley Regional Council's Living Books event in Gatton to promote a second community conversation, and to encourage people to attend. Because of my past as a community worker, I was keen to be involved in a participatory process at the ADCQ. The Commissioner's vision was to use a strength-based approach and involve staff working across teams, to share knowledge, skills, and experience. It was about starting something, and giving things a go . I talked to the Community Relations Officer about training and about her community development studies, and about what community development means in the field in practical terms. We talked about the first Lockyer Valley conversation and I was keen to get involved in the second conversation, so we arranged a visit in September to Lockyer Valley to promote it and hand out flyers. I felt that for the conversation to work we needed to meet people, build the trust of the community, and work directly with local stakeholders. The community needed to be able to put a face to a name in order to understand the Commission. We also met with the LAMP worker, and visited a community advocate who talked about her work with migrant communities and advocacy for refugees. The second community conversation was held in November 2013. This time, due to the local connections the ADCQ was beginning to make, and the LAMP worker's targeted promotions in the media, this event was attended by much larger numbers, including high school students, business owners, farmers, workers from community organisations, migrant and refugee groups, local government staff and elected representatives, backpackers, international students and Council officers. Over 50 people participated, and it was clear that the community was keen to work together to create a more inclusive society in the Lockyer Valley. building community capacity to participate in life in the Lockyer Valley. Through the world café process, participants had the opportunity to tell their stories of life in the Lockyer Valley, and propose ideas for a way forward, and ADCQ officers were able to establish new relationships and connections with key stakeholders and community members. Notably, once again in the second conversation, concerns for seasonal farm workers were mentioned, with personal stories about being employed for farm work by labour hire contractors who did not pay appropriately or follow any industrial relations or health and safety regulations. The lack of formal English language classes was also raised again. We came to Australia from Kenya in 2013 for my wife to do a Masters in Agribusiness at The University of Queensland. I came across the ADCQ at the Lockyer Multicultural Festival and was interested in what they do because we had met some horrible people whose mission was to make us feel unwelcome. I told the ADCQ worker about our experience in Gatton. Once we were walking round our block when young men in a ute slowed down and did the monkey sign. Another time a couple in a car circled a roundabout three times and shouted Welcome to Australia showing the middle finger. Most intimidating are the bumper stickers with F*** off we are full , or Stupid, learn some English and white supremacy flags. This was a divine connection. The ADCQ worker explained that not all Australians are so hostile, but she acknowledged the problem and said the ADCQ is committed to making Queensland inclusive. Above all, she and a friend were very warm and welcomed us to their homes. We were strangers yet they showed us kindness we hadn't even experienced in Kenya. One helped me get my first job in Australia, which has helped me build my business in Kenya. I will be forever grateful to Australia and those two kind ladies. The ADCQ invited us to their Gatton Community Conversation in November 2013. It was a great conversation. In my first 2 groups, everyone seemed to know what issues affected different cultures, but there were taboo topics, such as why don't we find different cultures employed in various shops or companies, or see people freely mingling in streets, parks, or workplaces? . In my final group I decided to encourage everyone to be candid and not hold back. That's when I heard things at the heart of the matter. One lady said she was upset with us foreigners as we refuse to adopt Australian culture. Another said we men of African descent are violent wife-beaters. It was really interesting. We actually had a conversation! The group asked me to summarise our discussion. Bottom line; the conversation has to continue — that's when we say what is causing all the misunderstanding, often founded on half-truths or plain ignorance. We met some amazing people in Gatton, but a few make it hard for foreigners to feel welcome. I left never knowing my neighbours' names. They didn't care even when my wife tried to reach out. In the end, we decided not to stay in Australia but we hope to visit soon and still believe it's a great country. Following the community conversations, the ADCQ officers continued discussing possible activities to promote community cohesion with the LAMP worker and new Settlement Officer in Gatton. They provided many more opportunities for ADCQ officers to meet community members and build local relationships, and also introduced them to key stakeholders such as staff from the Department of Immigration and Citizenship to talk about possible collaborative activities in the region. An introduction to the Council Business Development Officer led to an ADCQ presentation on the benefits of diverse and inclusive workplaces at a Lockyer Valley Better Business Network Breakfast and a connection with the Lockyer Valley Toastmasters was made with an offer forthcoming for leadership training for migrants and refugees. This work around discrimination issues and building a more inclusive community turned out to be only the beginning of the ADCQ's work in the Lockyer Valley. Significantly, after this first year's work, the ADCQ officers also began to look at how they could assist the community on the broader human rights issues raised again and again about the lack of English language tuition and concerns about accommodation and work conditions for seasonal farm workers. On 20 November 2013, ADCQ officers had a meeting in Gatton with the President and Vice-President of the Darfur (Sudanese) Association, and the Lockyer Valley Regional Council's (the LVRC's) Multicultural Project Officer who had arranged it. It was a beautiful day; the park near Council was enticing and no-one wanted to be inside, so we had the meeting on a park bench. The purpose was to find out how the ADCQ and Lockyer Valley Council could work together to assist the local Sudanese community. We expected to hear stories of discrimination and vilification, but both men had one clear message for us: We need to learn English! This was a concern also voiced at two Gatton community conversations hosted previously by the ADCQ and LVRC, as there had been no Adult Migrant English Program (AMEP) in the Lockyer Valley since 2012. Informal conversation classes delivered by the Gatton Baptist Church, the LVRC, and the Multicultural Community Centre, as well as a formal literacy program delivered by Career Employment Australia were aimed at people with good English, and did not meet the needs of all the community. On returning to Brisbane, ADCQ officers contacted TAFE English Language and Literacy Services (TELLS) and arranged a meeting to explore opportunities for increasing English language classes in the Lockyer Valley. The Director of TELLS attended with her team and explained that AMEP had been suspended in the Valley in 2012 when numbers dropped. They were eager to reinstate it but first wanted to meet the community to gauge interest, and hear what needs they had in terms of timing, child care, transport etc. ADCQ consulted with other providers (Career Employment Australia, Multicultural Development Association, and Access Community Services) and invited them to participate as well. On Sunday 13 April 2014, the ADCQ, in partnership with LVRC, facilitated the Gatton Let's Talk English community conversation with the purpose of bringing TELLS and other training providers together with the community to identify English language training and support needs, and to discuss options for local language classes. Over 60 community members attended from migrant and refugee communities, community organisations, and community members interested in helping people improve their English. –establishing access to online AMEP for students matched with volunteer tutors. The TAFE English Language and Literacy Services (TELLS) agreed that if we could find 12 participants, they would deliver the Equal Encounters Volunteer Tutor course in Gatton. They provided program flyers; the Lockyer Valley Council officers advertised it in the local Gatton Star paper and coordinated RSVPs, and the ADCQ promoted it through its Lockyer Valley email network. RSVPs came in steadily and suddenly 38 people had registered. TELLS asked LVRC to cap the registrations and LVRC had to turn 12 people away. On 12 July 2014, Toowoomba TAFE delivered the course with full attendance and good feedback. After Let's Talk English, we realised it was unlikely that AMEP-eligible migrants and refugees would come forward on their own initiative in sufficient numbers to get the Adult Migrant English Program (AMEP) reinstated. In consultation with the LVRC and Toowoomba TAFE, ADCQ officers designed a survey for community members to conduct with migrants and refugees to find out who was in the area, what their training needs were, and what they may be eligible for. This process began in June 2014 and over 50 people were surveyed. Although many of those assessed were on bridging visas and ineligible for AMEP, Toowoomba TAFE advised they could deliver 40 hours of free English tuition to people on bridging visas, and have since held 3 well-attended bridging visa courses in Gatton, working with LVRC and Toowoomba MDA to identify students. The survey process continued, but did not identify significant numbers of people eligible for AMEP in the Lockyer Valley. However it did provide an avenue for ADCQ officers to build on their relationship with Toowoomba TAFE. In June 2015, the LVRC Settlement Officer identified funding that could be used for informal English classes, located an interested Equal Encounters volunteer tutor, and asked the ADCQ to contact Toowoomba TAFE for curriculum assistance. Toowoomba TAFE provided information on curriculum, but expressed renewed interest in reinstating AMEP. They suggested that if the Settlement Officer could find 20 potentially eligible people, they would send someone to Gatton to do a full day of assessments. The assessment day was on 16 September 2015 and identified enough potential students to start an AMEP class. The Settlement Officer worked with Toowoomba TAFE to help complete the assessment process, and on 19 October the first AMEP class opened in Gatton since 2012. Following the Equal Encounterstraining, the former LVRC Multicultural Officer (who also attended the course) and the retired AMEP teacher who ran the Baptist Church conversation classes coordinated the matching of new volunteer tutors with students. They arranged for tutors to meet with students at the Lockyer Valley Library Digital Hub, if they had nowhere else to meet. This has potential to fill a gap for students not eligible for AMEP or unable to attend scheduled classes. The new LVRC Multicultural Officer also acquired tutor resources to be available at the library. The partnership between the Anti-Discrimination Commission Queensland, the Lockyer Valley Regional Council, community members, and Toowoomba TAFE led to these valuable community outcomes. Listening to community concerns led the ADCQ to advocate on their behalf, as we recognised that helping the community gain access to English language tuition would empower them to participate fully in society, and contribute to the ADCQ vision of promoting a fair and inclusive Queensland . 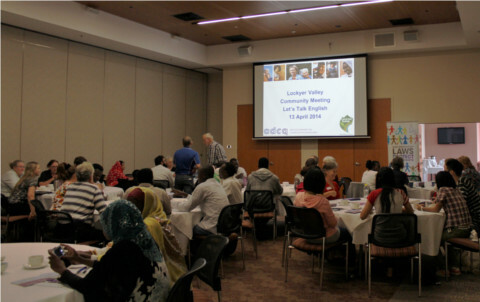 In September 2013, the ADCQ was working in partnership with the Lockyer Valley Regional Council (LVRC) Multicultural Project Officer, to plan a second Lockyer Valley Community Conversation for November 2013, on the theme of Creating a Fair and Inclusive Community . The Multicultural Project Officer suggested an upcoming LVRC Living Books event would be the perfect opportunity for ADCQ to promote the November Conversation and explain the new ADCQ LV Community Engagement Strategy. So, an ADCQ officer travelled to Gatton to speak at the event. She found a spare seat, and introduced herself to the people around the table, none of whom she knew, at this stage. One of the people at her table was Joanne (name changed), a community member who, as the ADCQ officer was soon to find out, was a formidable advocate for human rights issues in the Lockyer Valley, particularly for refugees, migrants, and backpacker farm workers. As soon as Joanne heard where the ADCQ officer worked, she said with a smile on her face, I've got a bone to pick with you! During the evening the officer chatted with Joanne to find out what her bone was. It turned out Joanne was involved in running free English classes with a volunteer group at the Baptist Church. Most of the students were backpacker seasonal farm workers with little English or knowledge of Australian workplace rights. The group also held monthly barbeques at the caravan park to support the classes. Many of the students had come to trust Joanne as someone to talk to if they had a problem. That evening, Joanne told the ADCQ officer disturbing stories of backpacker farm workers being exploited and sexually harassed, mostly by contractors engaged by farmers to hire workers to harvest crops. Joanne told of injured workers calling to ask her to take them to hospital when a contractor refused to, of non-payment or under-payment of wages, of unsafe workplace practices and sexual harassment. The ADCQ officer explained that although the ADCQ could take complaints about sexual harassment, workplace rights issues were generally a matter for the Fair Work Ombudsman (FWO). Joanne said she had been sending emails to the FWO on behalf of backpackers, but hadn't had a response. The ADCQ officer suggested that like the ADCQ, the FWO may need to get complaints directly from those affected. Nevertheless, she encouraged Joanne to continue sending emails about workplace exploitation to the FWO, even if the backpackers weren't prepared to make complaints, because if the FWO realised there was a systemic issue in the region, they might be able to take action without complaints. The issue of seasonal farm worker exploitation had already come to the attention of ADCQ officers through the LVRC Multicultural Project Officer and at the first LV Community Conversation in August 2013. Participants at the Community Conversation had made comments such as segregation of backpacker farm workers , not looking after our backpackers reflects badly; negative experiences = poor reputation , and lack of compliance/regulations for backpackers/farm workers . Back at the office, the ADCQ officer discussed this disturbing new information with her project partner. They thought it might be beneficial for the ADCQ to work in partnership with the FWO in the Lockyer Valley to raise awareness of discrimination, sexual harassment and workplace rights. They discussed the idea with the ADCQ Commissioner and Deputy Commissioner. In October 2013, the Deputy Commissioner called the Director of Regional Services at FWO. The Director explained that they were in the first year of a new Harvest Trail Project which was looking at precisely these issues concerning seasonal farm workers in other agricultural regions, although the Lockyer Valley was not yet a focus. He proposed a teleconference to hear more about the issues from ADCQ officers, during which he gave them contact details for two FWO officers to discuss a joint information session for Lockyer Valley seasonal farm workers. a commitment from the FWO officers to take the information back to their colleagues to consider making the Lockyer Valley a region of focus for the Harvest Trail Project. Also, one FWO officer remembered seeing emails from Joanne and promised to contact her. At the start of the second ADCQ Community Conversation in November, Joanne approached the ADCQ officer she had met at the Living Books event. The ADCQ officer was pleasantly surprised when Joanne enthusiastically related that she now had an FWO contact whom she spoke to regularly about issues in the Lockyer Valley, and who was working with her to see how they might assist farm workers. My first memory of contact with ADCQ was at the November 2013 Community Conversation. I was very happy the ADCQ was willing to come to the country. We often feel deserted as people from the city generally don't come to see us. The ADCQ contact gave me a good start; she listened and let me know how to act. The first time a young Asian worker told me a contractor had raped her, the only thing I knew was to tell her to go to the police, which she didn't want to do, fearing the contractor wouldn't renew her friend's visa. Having the ADCQ contact and knowing how to act was important, as until then I had only thought of calling the police. I was also happy with ADCQ officers at the Seasonal Farm worker information session, as the language they used was helpful for people not from English-speaking backgrounds. The farm workers felt they now had somewhere to go to, as the ADCQ was approachable. Even though a complaint can take some time, they can get advice very quickly. The most important thing for me about ADCQ involvement in the Lockyer Valley, apart from giving us contact with an organisation (FWO) that can help us with the farm worker issue, is that now we feel things are coming to a head, and we're beginning to have a bit of an impact. It's slow, but it's happening. With the 4 Four Corners program and several news articles getting attention, we are getting somewhere. In February 2014, an ADCQ officer and LVRC Multicultural Project Officer attended an employer forum in Gatton held by ACCESS Community Services. Here the ADCQ officer made the first connection with a local farmer concerned about farm worker exploitation. A month later ADCQ officers conducted community visits to the Lockyer Valley, including to Sarah's (name changed) farm. They sat on the porch talking to her and her husband, and heard stories of them being threatened by contractors if they didn't want to use their services, and undercut on prices to big retailers by farmers who used contractors. Sarah felt most farmers turned a blind eye to backpacker exploitation as it was easy and cheap to use contractors. What struck the ADCQ officers most about Sarah's situation was that she and her husband appeared to feel quite isolated in their concerns about the problem. However the ADCQ officers knew that there were other members of the Lockyer Valley community who were very vocal and active on the issue, so they decided to connect Sarah with two of the most active of those community members – Joanne and the Lockyer Valley Multicultural Officer. A few months later over lunch in the Lockyer Valley the introductions were made and they are, at this writing, working together towards a long-term solution. Meeting the ADCQ officers and discussing issues was excellent. So many people are involved and no one wants to be responsible, but it is about doing the right thing. A lot of growers say contractors are responsible, but these things are happening on their property. The ADCQ officers really do care, and this is significant for me. They have done an excellent job of trying to nut out what is going on and understand the bigger picture, and have uncovered a lot of dirt too, which is very impressive. Big farms produce billions of bunches yearly, so if they pay workers one cent less per bunch they make hundreds of thousands more per year. Contractors offer cheap workers and pocket 2 or 3 cents per bunch. I know of one who, after 2 years in business owned 2 houses. They make big money by paying workers less, and have a market when supermarkets take too much profit, leaving nothing for growers who are under stress to survive. Some growers try to follow legislation and do the right thing but it's hard if others pay illegally and pull the market down. This is difficult to fix as it's the state of the nation. A spotlight has been shone on practices in the area lately — the subject is on everyone's lips as they are sick of the situation — but I don't think there has been a culture change yet as large growers continue these practices. It's not the fault of the ADCQ as it involves many people and industries. We need a governing body that looks out for people's wellbeing, involves farmers, and coordinates decision makers. The strong hand of the law needs to come down or people will continue to get away with it. Ten years ago some of us started a group to educate farm workers who were then given a card showing they'd had training. Some people are now thinking of starting it up again if we can find funding. There is also talk of a card to help farmers employ directly and make paper work easier. With evidence mounting that this was a significant human rights issue in the Lockyer Valley, the ADCQ officers met with senior management again to discuss what they could do to raise awareness and encourage the community to take action. Anti-Discrimination Commission holds Forum on labour issues. As a result, the ADCQ facilitated two events in Gatton with the FWO in September 2014. The first was an information session for about 40 seasonal farm workers about workers' rights, after which some discussed potential complaints with FWO or ADCQ officers. The second was the Gatton Community Forum on Labour Hire Practices for Seasonal Farm workers. Participants included farmers, workers' groups, community organisations, elected representatives, council officers, police officers and contractors. They were asked to discuss questions about working and living conditions for seasonal farm workers in the region, and ideas for community-led solutions. Farmers wanting to do the right thing connected with each other and with community members helping workers. Also, with the issue gaining publicity around the country, the forum summary was sent out to many different stakeholders, including elected representatives, who raised the issue in Parliament. The forum was reported on in the local Gatton Star , and this was picked up by the Toowoomba Chronicle and the Courier Mail which contacted the ADCQ for information for articles. I became interested in the backpacker contractor issue after being briefed by ADCQ officers on their work in the Lockyer Valley, and reports they had heard of exploitation of agricultural workers. As we looked more closely into the issues and at media reports across Australia, it became obvious this was systemic in most horticultural areas in Australia, and that there were a range of stakeholders with their own interests, including workers, farmers, labour hire contractors, purchasers (big supermarkets), and regulators or enforcers with responsibility for related issues at all government levels. As systemic underpayment of wages seemed to be a primary concern, I thought we should contact senior management in Fair Work Australia to ascertain what was being done to address the issue. I was keen to know if they also considered it a systemic problem across Australia, and what the ADCQ should be telling the Lockyer community, so I contacted the Fair Work Ombudsman's Director for Regional Services. This led to the ADCQ developing close contacts with Fair Work in Toowoomba, information and contact-sharing, and ADCQ working collaboratively with the Fair Work Ombudsman and Qld Workplace Health and Safety to provide training and information to the Lockyer community. Following increased engagement of FWO officers in the Lockyer Valley, direct connections between them and concerned community members were more firmly established. Information on exploitation and specific complaints were more forthcoming, and in 2015 the Lockyer Valley did become an area of focus for the Harvest Trail Project. The FWO has intervened on behalf of many LV farm workers, recovering tens of thousands of dollars for them through negotiation with employers or litigation. It is also educating farmers on their obligation to ensure workers are paid appropriately and safe at work. The FWO launched legal action against Queensland labour-hire operator Seasonal Farm Services, alleging it underpaid 144 employees supplied to pick and pack fruit or vegetables on Lockyer Valley farms a total of $60,780 in 2014/2015. Most were on working holiday visas, some only 19 years old. After an employee allegation, the FWO investigated Seasonal Farm Services as part of its national Harvest Trail Inquiry aimed at improving compliance with workplace laws in the horticulture industry. It is alleged inspectors found employees were paid from $5 to $2.50 less per hour than they were entitled to under the Horticulture Industry Award, and that underpayments persisted for several months after the FWO put the company on notice. The largest alleged underpayment is $2820. The FWO also alleges the company contravened record-keeping laws, failing to keep records for 70 employees paid piece rates. This prevented it from assessing if they had received their minimum lawful entitlements. The Ombudsman said the FWO decided on litigation because of the seriousness of the alleged contraventions and failure to rectify. Visa-holders can be vulnerable if they are not fully aware of their rights or reluctant to seek help, so we place a high priority on taking action to ensure their rights are protected. Concerned community members have been motivated to become more active in helping farm workers report to the FWO because they are more connected to the FWO and to other community members with similar concerns, including farmers who want to make sure their workers are well treated. Also, some people are working together on a local solution to offer a hub for seasonal farm workers providing information on where to find work without relying on contractors, their rights, workplace health and safety, and decent accommodation. Also, as a result of the media coverage on the ADCQ's involvement with this issue in the Lockyer Valley, multiple government stakeholders have approached the ADCQ for information, and a large legal firm contacted the ADCQ offering pro bono assistance for Lockyer Valley workers. The ADCQ put the firm in touch with a community member who is active in assisting workers. A stronger connection between ADCQ and the FWO has helped the information flow to FWO, with the ADCQ providing the FWO with information it has gathered, whilst also continuing to help the FWO connect with the community to gather data for their report to the Federal Government on the Harvest Trail Project. Most significantly perhaps, the heightened focus on problems in the Lockyer Valley has contributed to a broader focus by the Queensland government on the systemic issue across the State. In late 2015, the Queensland government convened the Horticulture Workers Interagency Group (HWIG) of State and Federal agencies to consider the issue of safety, well-being and rights of travelling workers employed in the horticulture industry. As a member of that group, the ADCQ provided substantial information gathered through its work on the Lockyer Valley project, including on the UK labour hire contractor licensing scheme being considered by the Victorian government. examination of possible actions to improve accommodation for horticultural workers, including law reform. The ADCQ corresponded with the Minister for Employment and Industrial Relations following the release of the inquiry report, and in November 2016 the ADCQ Commissioner received a letter from the Minister stating that the Queensland Government is now considering a labour hire licensing scheme similar to that which is being considered by Victoria and South Australia. In May 2017, Queensland Premier Annastacia Palaszczuk, and the Minister for Employment, Grace Grace, announced that mandatory licensing of labour hire companies will be introduced in Queensland in a bid to crack-down on rogue operators who are exploiting and mistreating vulnerable workers . The Premier noted that Some of these workers were at times forced to work entire days harvesting produce without food or drink, without pay, as well as being forced to live in isolated transient accommodation . Wide consultation demonstrated vast majority support for mandatory licensing which will aim to protect workers and enable ethical operators to compete fairly. A compliance unit will be established to check licence-holders for continued compliance and to investigate complaints. As Rosetta noted in her story, the ADCQ has not been able to stop farm worker exploitation in the Lockyer Valley, or change the culture of unscrupulous practices. This issue requires legislative change in Queensland and other parts of Australia before far reaching cultural change can happen. That will take time and require the patience and effort of multiple stakeholders across government, the industry, and the community. However, without the steps taken by individual agencies, such as the ADCQ and the FWO, and in particular by community members on the ground, broader cultural change will not be possible. It remains to be seen how significant the results of the various inquiries will be, but at the time of writing it is very promising that three state governments, including the Queensland Government, have committed to considering a labour hire licensing scheme. Following the Gatton Seasonal Farm worker Community Forum and the information session for seasonal farm workers, ADCQ officers and senior management determined that the ADCQ had done all it could do about farm workers' work rights. The appropriate agency, the Fair Work Ombudsman, was now very active in the region and community members were well connected with them. However, because of the close relationship between ADCQ officers, Lockyer Valley Council workers, and community members, information continued to come through about sexual exploitation of seasonal farm workers and exploitative practices in the provision of accommodation by labour hire contractors — issues that were also raised at the ADCQ Gatton Seasonal Farm worker Community Forum. Sexual harassment had been discussed in the farm workers' information session, and ADCQ officers continued to liaise with Joanne, the former Multicultural Project Officer, and other community members in whom victims were confiding, in order to make sure that they were able to support the victims with relevant information about sexual harassment and the ADCQ complaint process. As the media interest around Australia continued to grow, the ADCQ also took every opportunity to raise awareness of the issue by contributing to multiple media stories and by writing to elected representatives who were raising the issue in Parliament or the Senate. Farm employers manipulate female backpackers into sexual acts in return for Australian visa sign-off. ABC Online news, 31 July 2015. While exploitative accommodation practices were, strictly speaking, outside the jurisdiction of the ADCQ, workers were particularly vulnerable to sexual harassment because farm worker accommodation was often provided by contractors who were also employers signing visa extension applications. Therefore the ADCQ regarded the two problems as related, and was also concerned about exploitation in accommodation in terms of broader human rights. So, at the end of 2014, the ADCQ connected with the Residential Tenancies Authority (RTA) about the possibility of working together on the Lockyer Valley accommodation issue, as it had done with the FWO on the farm workers' work rights issue. However, to our surprise and concern, the RTA said it did not have jurisdiction over seasonal farm workers' accommodation as boarding houses and hostels were regulated by the Residential Services Accreditation Act administered by the Residential Services Unit (RSU). The RTA also advised that some councils took responsibility for such accommodation through by-laws, such as Brisbane City Council's by-law that no more than four unrelated people can be tenants in a house without a licence. The ADCQ contacted the RSU in the Department of Housing and Public Works, but once again they advised that they did not have jurisdiction over accommodation for seasonal farm workers, if they were tourists or holiday makers. The RSU officer said she had investigated a recent complaint from Queensland Fire and Emergency Services (QFES) about overcrowding in an informal hostel in Gatton, but could not prosecute because the landlord could prove that tenants were on foreign visas . Her advice was that the onus is on local councils and QFES to regulate housing for “foreign visa holders” , and that the ADCQ should contact the Local Government Association of Queensland (LGAQ). So the ADCQ's next port of call was LGAQ, where an officer confirmed that enforcement of building and fire safety regulations relating to housing for foreign visa holders was the responsibility of local councils and QFES. However, the LGAQ officer advised that any relevant local by-law or licensing requirement was at the discretion of individual councils. Therefore she believed that the ADCQ had apparently identified a gap outside a number of organisations' responsibilities and jurisdictions for the protection of rights for tourists or holiday maker tenants. In my voluntary position I kept up contact with the Commission, and with people working on a lot of different issues. This made me more aware and able to share information with the broader community. In terms of farm workers and contractors, the cross-communication, the sharing of information and the direct contact with the Commission and Fair Work is brilliant — there seems to be momentum. I feed information to both and in the other direction to growers, although growers often don't respond. I think we are where we are due to the relationship with the ADCQ officers (Caron and Enda) and their commitment. They would be here at multicultural festivals and other events, raising awareness, engaging the community in what they were doing. They were very good at keeping up connections and working out who they could work with. Even with those who were difficult to work with, they figured it out. The challenge is how to keep going when there is only a very small resource pool of volunteers and no local agency that is really supportive. I think Council should be in that role, so I am meeting with the Mayor and Deputy Mayor. I want to reinforce the connections that have come out of relationships built with Caron and Enda and as a result of the momentum, such as the Fair Work Ombudsman, Qld Fire & Emergency Services, Stanthorpe Harvest Trail office (BEST Employment), Department of Immigration, Fair Trading, Clayton Utz law firm, growers, and now some positive momentum with Lockyer Valley Regional Council. Enda and Caron have always been more than professional, and their commitment has resulted in the momentum and traction that has been achieved. The issues have gained broader awareness in the community and more people are aware and talking about the situation. At this point the ADCQ officer doing the research decided to raise the apparent lack of accommodation rights for seasonal farm workers on working holiday visas with the Deputy Commissioner, who was herself surprised to hear that the RTA (or any other agency) could not assist these tenants. ADCQ officers working on the Lockyer Valley met with the Deputy Commissioner to discuss the issue and how to proceed. The Deputy Commissioner began to do her own research and found an article indicating that the Southern Downs Regional Council (SDRC) had been very proactive on the issue. So, in February 2015 the ADCQ contacted the SDRC Planning Compliance Officer mentioned in the article. She turned out to have a wealth of knowledge on the legislative framework available to Councils to address safety in accommodation for non-residents, and to be very keen to share information about SDRC strategies and activities, as she believed other regional councils could benefit from SDRC's experience. SDRC had become very active on the issue because backpackers are crucial to its economy, and it was concerned about significant overcrowding and unsanitary conditions in backpacker accommodation, and the associated risks of fire, injury, disease, and negative publicity. The SDRC Officer believed the key to their success was the Mayor's commitment to the safety of seasonal farm workers, not only because he saw them as vital to the regional economy, but because they were visitors to the region, and were young and vulnerable. In this way a new and productive relationship was born, which was a turning point for the ADCQ on the issue of accommodation rights for seasonal farm workers, as it was now connected with a Council using the existing legal framework to deal with the problem in a horticulture region. The ADCQ learnt a lot from the SDRC Officer about how SDRC was working to make existing backpacker accommodation safe by enforcing compliance with building and fire safety regulations, and by encouraging purpose-built backpacker accommodation to address the shortage. The ADCQ connected Lockyer Valley community members with the SDRC Officer so that she could share this information with them as well. Most notably, the ADCQ learnt about Council obligations to inspect budget accommodation buildings (BABs) for fire safety standards since the Childers backpacker hostel fire in 2000, and that SDRC conducted joint inspections of BABs with QFES. In 2013 and 2014 ADCQ officers did extensive work in the Lockyer Valley speaking with stakeholders, and running forums and workshops to help facilitate the best way for the local community to address issues raised around exploitation of farm workers. Gradually we came to better understand the issues, and what the various regulators were doing to address their jurisdictional responsibilities. By June 2014 it became apparent that an area that seemed to be getting less attention was accommodation deficiencies for rural horticultural workers. We were aware that overcrowding of accommodation could be addressed through Queensland Fire and Emergency Service prosecutions for non-compliance with fire and emergency legislation, and that QFES would take action to deal with fire safety risks. With regard to complaints about substandard accommodation on other issues such as public health (blocked pipes, sewerage overflows etc), or civil issues such as withholding of rent and bond monies, and privacy and personal safety (allegations of sexual harassment), we thought the Residential Tenancies Authority may have some responsibility. After investigation it became apparent the RTA had no jurisdictional responsibility, and that only local councils could pursue some of the issues, if they had passed relevant by-laws. We began to check if Lockyer Valley Council had relevant by-laws and what they were doing to enforce them. I became aware that Southern Downs Regional Council seemed to be working very proactively to address accommodation concerns and suggested to Caron that she contact them to find out more. We discovered this Council had a high level of understanding of the issues and the importance of protecting the rural workers so vital to the local economy. It had passed by-laws and delegated resources and responsibility to a diligent officer to promote and enforce them, and to educate the community about what they need to do in order to comply. Harvest trail councils had varying levels of activity, knowledge, or capacity to look after accommodation issues. So we decided that to help develop capacity across Queensland and to ascertain other means of improving accommodation services and conditions for rural workers, it would be useful to host a forum in July 2015 for local councils and other relevant stakeholders. The ADCQ asked the SDRC Officer for a relevant QFES contact, which ultimately led us to the Manager of the QFES Compliance and Prosecution Unit. This contact would prove to be a crucial partner in achieving concrete outcomes both locally in the Lockyer Valley, and more broadly within government. The ADCQ arranged a meeting with the QFES Manager, in which he explained that as a result of the Childers hostel fire, the QFES now had a specific focus on the issue of overcrowded, unsafe accommodation for backpackers, and was dedicating significant resources to inspecting such premises. The ADCQ learnt a great deal more about the legal framework relating to fire safety conditions in backpacker accommodation, and shared information about the Lockyer Valley community's concerns with QFES. The meeting concluded with an agreement on two actions going forward. Firstly, the QFES Manager provided his email address for the ADCQ to pass on to community members in the Lockyer Valley who had information about unsafe accommodation. Also, it was decided that it would be beneficial to bring all levels of government together to raise awareness of this complex problem and some of the strategies being implemented, and to work together on more comprehensive solutions. The Manager agreed to present the QFES perspective at an ADCQ facilitated forum. The ADCQ then asked the SDRC Officer if she would talk about SDRC's work at an ADCQ forum. She readily agreed because, like the ADCQ, she firmly believed that connections and information sharing was invaluable. She also put the ADCQ in touch with the Camping Strategy Coordinator at North Burnett Regional Council (NBRC) with whom she had just connected. NBRC too was implementing new strategies for improving accommodation standards for seasonal farm workers, so the ADCQ connected with the Camping Strategy Coordinator, heard the NBRC story, and invited her to present NBRC's work at the upcoming ADCQ forum as well. In the interim, the ADCQ officers working on the Lockyer Valley project were invited by Vicki to present at a SDRC forum in Stanthorpe, which discussed the risk to the reputation of the Southern Downs Region and its rural industries posed by inappropriate treatment of seasonal workers. The ADCQ officers presented on issues they had encountered in the Lockyer Valley and the work they were doing in this regard. At that forum the SDRC Mayor gave a passionate and moving speech about why it was so important to protect the visiting farm workers. The ADCQ officers asked if he would do the same at the upcoming ADCQ forum. And so, in August 2015, the ADCQ facilitated a one day forum on Safety in Budget Accommodation for Non-Resident Farmworkers for government stakeholders including Mayors, Deputy Mayors, CEOs and Compliance Officers from 14 Queensland Councils, and officers from eight State government agencies and 2 Federal government agencies. Representative of the Local Government Association of Queensland and Tenants Queensland also attended. The relationship between ADCQ Officers and SDRC Officers has been very beneficial to my work at Southern Downs Regional Council on accommodation issues for seasonal farm workers. Over the past 4 years it has sometimes been frustrating when trying to find out who can assist when dealing with activities that are clearly unlawful. When the ADCQ contacted me a problem became shared, and with their influence much more has been achieved in trying to educate the broader community on what is required in relation to the accommodation rights of workers. I am hoping that the ADCQ Forum on Budget Accommodation for Non-Resident Seasonal Farm workers will lead to actual outcomes. With the influence of ADCQ the attendees were people of importance who could actually make a difference. The forum was well organized and attendees participated in all discussions. The forum heard from the ADCQ about its work in the Lockyer Valley and its concerns about human rights abuses in accommodation for farm workers, and from QFES, SDRC, and NBRC about the work they were doing to crack down on unsafe accommodation and engage with seasonal farm workers to integrate them into the community. Participants then broke into groups to discuss the problem and possible proactive solutions at all levels of government. Later, a summary was prepared by ADCQ that captured the issues discussed, and the ideas and suggestions put forward. This was distributed to participants and other relevant stakeholders, including elected State and Commonwealth representatives. Feedback from forum participants indicated that they had established valuable connections at the forum that would help them address the issues discussed. Although, with the exception of the related incidences of sexual harassment, many of the issues surrounding the exploitation of farm workers in accommodation were not specifically related to the Queensland Anti-Discrimination Act , the ADCQ perceived them as broader human rights issues of concern to the Commission. 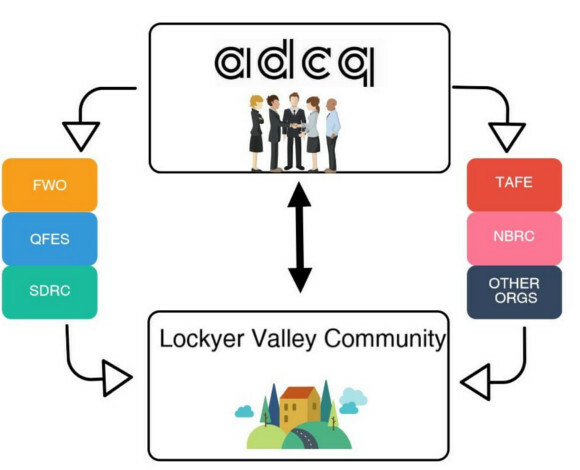 Therefore, a significant amount of the work done by the ADCQ involved connecting with other organisations such as RTA, RSU, LGAQ, QFES, SDRC, and NBRC, in order to help the Lockyer Valley community find ways to address the issue at a local level, and to explore solutions at the government level. At the community level, the ADCQ connected concerned Lockyer Valley community members with councils in other horticultural regions that were keen to share information about their innovative work on ensuring decent and safe accommodation for seasonal farm workers. In preparation for a meeting with LV Regional Council regarding their concerns, Lockyer Valley community members teleconferenced with Vicki at SDRC to talk about how it was using local by-laws to regulate and improve budget accommodation for farm workers. That relationship has continued with further exchanges of information and a Lockyer Valley community member participating in the SDRC forum and other events. At the community level, ADCQ connected concerned Lockyer Valley community members with QFES. They have supplied valuable information about unsafe accommodation to QFES that has led to at least two prosecutions and the closure of unsafe premises. Also, a Lockyer Valley community member later heard from a Japanese farm worker she had previously assisted, that a contractor who had been prosecuted was no longer demanding that his workers stay in his accommodation. At the government level, there is now a heightened awareness of the issues surrounding the lack of rights and protections for non-residents in accommodation, and of how those issues are related to the broader problem of exploitation of seasonal farm workers across the State. As a direct result of the ADCQ forum, government agencies at all levels have made important connections that we hope will facilitate the flow of information and will assist with the implementation of solutions both locally and state-wide. As a member of the Queensland Government Horticulture Workers Interagency Group (HWIG) mentioned in the Exploitation of seasonal farm workers section of this report, the ADCQ chaired the Accommodation Subcommittee, and developed a brochure on sexual harassment that targeted farm workers. This brochure was translated into multiple languages by the Queensland Police Cultural Liaison Office for its new Facebook page for non-resident farm workers, and for rural Pop Up information sessions for farm workers which it arranged on behalf of the HWIG Work Subcommittee. In response to the 2016 Queensland Government report into the Inquiry into the practices of the labour hire industry in Queensland , the ADCQ continued to advocate that the government examine what actions it could take to improve accommodation for non-resident horticultural workers, including through law reform or any other strategies it implements. In December 2016, the Queensland Government announced its intention to explore the option of regulating the labour hire industry through a licensing scheme, and released an issues paper for public comment. The ADCQ's response again advocated for the provision of accommodation to be addressed in any such scheme. Queensland Government Fire and Emergency Services media release. An illegal and unsafe budget accommodation building in Gatton has been prohibited from operating today following a successful action by Queensland Fire and Emergency Services (QFES) in the Supreme Court. QFES Commissioner Katarina Carroll said QFES took action to successfully seek an interim injunction which prohibited accommodation being provided at the premises last week. The injunction was made permanent today. The threat to life at these premises was so serious that QFES officers decided to take action in the Supreme Court as a matter of urgency, to ensure the building owners did not continue to provide accommodation to any person, Ms Carroll said. Due to the construction of the two storey building, guests would be faced with unprotected and extended travel distances when exiting the premises, as well as a lack of smoke alarms and emergency lighting. If a fire started at this building, our officers were concerned the people inside would have had absolutely no chance of escape. We're confident that today's court action will prevent a serious tragedy and protect at risk persons like transient workers and international tourists working in the horticulture industry from serious risks such as injury or death. Ms Carroll said she was satisfied with the successful outcome, which prohibits the building's owners from providing illegal budget accommodation at the site permanently. This sends a strong message to those individuals and companies who put profit before people and operate budget accommodation that does not have appropriate fire safety systems, she said. People operating budget accommodation buildings have the lives of others in their hands and cannot ignore vital fire safety requirements. QFES is serious about building fire safety in Queensland and today's action is a demonstration of our commitment. We will continue to work with relevant authorities to ensure illegal budget accommodation operators are held to account. Budget accommodation fire safety standards in Queensland are some of the toughest in the country and owners who fail to comply could face maximum fines of over $200,000 and face possible imprisonment. Members of the public that would like more information regarding fire safety in budget accommodation buildings or would like to report a building that appears to be operating as a budget accommodation building are urged to visit. The ADCQ was also asked to contribute to a 2016 review of Queensland legislation regulating accommodation provision, in particular the Residential Services Accreditation Act . The ADCQ met with the review team to provide information on the gaps identified in protections for non-resident farm workers. At the local government level there is also greater awareness regarding Councils' obligations to ensure compliance of BABs with fire and safety regulations, and the legal framework that enables them to do so. The ADCQ was also able to connect SDRC with officers at the RTA and other agencies, who provided practical advice to assist SDRC in drafting a motion for the LGAQ AGM 2015. As a result, the LGAQ has developed a policy for all councils on Budget Accommodation. While local community-led outcomes have occurred quite rapidly, government based outcomes, by their nature, take time. The ADCQ is greatly encouraged by the Queensland Government's recent announcement that it will legislate to implement a labour hire licensing scheme, but acknowledges that this will take time and that it remains unclear whether such a scheme will encompass the provision of accommodation. Also, the Queensland government review of legislation regulating accommodation provision did not result in any further protections for non-resident tenants. 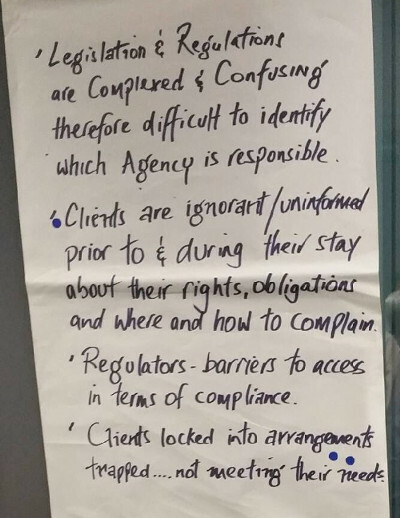 It also remains to be seen how councils will respond to the information they heard at the ADCQ forum regarding their responsibilities and existing capacity to enforce compliance in budget accommodation buildings. There is potential for the LGAQ to progress policy on budget accommodation, but this too will take time — if it eventuates. The ADCQ acknowledges that until there is regulation specifically aimed at accommodation protections for non-residents at State or Federal Government levels, solutions through local government will be mainly focused on enforcement and compliance. Interactions between government and the community through structures such as advisory committees, peak organisations, and community consultations often result in agencies working top down , where initiatives are designed and implemented by government, based on decisions made internally by them. In direct contrast to the top down approach, agencies can encourage meaningful community engagement to create community-driven initiatives and solutions through building personal relationships with community members and facilitating genuine participatory structures and processes. This has been the most effective part of our work in the Lockyer Valley, in which we have been the conduit linking community stakeholders with external agencies who can assist them with issues affecting the community. Local volunteers working with migrants or farm workers now have direct contact with agencies or organisations that can deal with complaints or help with services or referrals. With these organisations, they no longer have to struggle to navigate government structures, to work out who to talk to, or what information is critical for a complaint to be dealt with quickly and effectively, or to gain access to service providers. The ADCQ has been able to support the community, not only by facilitating the linkages described above, but also by directly advocating for change. We have identified that from our position within government, we have the potential to influence decisions made at senior levels of government agencies or statutory bodies, whereas Lockyer Valley community members expressed frustration about trying to achieve this from a grassroots level in rural isolation. Although issues of English language tuition for migrants, or poor work and accommodation conditions for farm workers were not initially the focus of the strategy, we realised that these were human rights concerns that could be addressed within the scope of the ADCQ's strategic vision of promoting a fair and inclusive Queensland , and therefore considered what action we could take to facilitate change. Catalysts, such as identifying gaps in legislative protections for farm workers in accommodation, or discovering the successful work being carried out by Southern Downs Regional Council in partnership with QFES, gave us the incentive to engage with these issues and organise activities such as the Safety in Budget Accommodation Forum for government stakeholders. continued fostering of the Anti-Discrimination Commission Queensland's relationships between community members and government workers by building on our networking role, and connecting with a greater diversity of clients. The success of the Lockyer Valley Community Engagement Strategy is largely due to the passionate commitment of local workers and community members to the wellbeing of their community. They invited us in, and have worked closely with us all the way. Ultimately though, it was the resolve of the Anti-Discrimination Commission Queensland's senior management to do strength-based community engagement that enabled the project to succeed. dialogical: This book proposes that community development has been increasingly influenced and co-opted by a modernist, soulless, rational philosophy, reducing it to a shallow technique for solving community problems . In contrast, this dialogical approach re-maps the ground of community development practice within a frame of dialogue, hospitality and depth. The Dialogical Method of Community Practice outlines the importance of balancing development from the inside utilising the existing community assets with the more traditional approach of development from the outside which focuses on meeting needs and addressing deficits. The framework gives priority to enabling communities to lead their own development with support from companies who are committed to managing their impacts and sharing the benefits from resources wealth. MSC: Most Significant Change technique is a participatory monitoring and evaluation technique that involves collecting significant change stories. strength-based approach: This approach focuses on identifying and developing the strengths of individuals, organisations, and communities, and empowering them to address issues locally through their own collective efforts and abilities. –sharing the insights or results of conversations from each group with the larger group. Atkinson, R and P Willis. Community capacity-building: A practical guide. Hobart: University of Tasmania, Housing and Community Research Unit 2006. Buber, Martin. I and Thou. New York: Simon and Schuster, 1999. Burkey, Stan. Working with People. In People First: A Guide to Self-Reliant, Participatory Rural Development . London: Zed Books, 1996. Davies, Rick and Jess Dart. The Most Significant Change (MSC) Technique: a Guide to Its Use . (Cambridge: The authors, 2005), 8. Friere, Paulo. Pedagogy of the Oppressed . London: Penguin Books, 1996. Kelly, A and I Burkett. People Centred Development: Building the People Centred Approach – Dialogue for Community Engagement . Brisbane: The Centre for Social Response, Australia, 2008. Kelly,A, A Morgan, and D Coghlan. People Working Together – traditions and best practice. Moorooka: Boolarong Press 1997. Lathouras, Tina. The nature of community development . In Developing Communities for the Future , edited by Susan Kenny. South Melbourne: Cengage Learning, 2010. Pawar, Manohar S. and David R. Cox, eds. Social Development: Critical Themes and Perspectives. New York: Routledge, 2010. Westoby, Peter and Owen, John. The sociality and geometry of community development practice , Community Development Journal 45, no. 1 (2010): 58-74. doi: 10.1093/cdj/bsp005. Wheatley, Margaret and Deborah Frieze. Joubert Park, South Africa: From Problem to Place. In Walk out walk on: A learning journey into communities daring to live the future now . San Francisco: Berrett-Koehler Publishers, 2011. 1. Rick Davies and Jess Dart, The Most Significant Change (MSC) Technique: a Guide to Its Use . (Cambridge: The authors, 2005), 8. 4. Adapted from the concept of Start anywhere, follow it everywhere mentioned by Margaret Wheatley and Deborah Frieze in the article Joubert Park, South Africa: From Problem to Place , in Walk out walk on: A learning journey into communities daring to live the future now . (San Francisco: Berrett-Koehler Publishers, 2011). 5. Tina Lathouras, (2010), The nature of community development , in Developing Communities for the Future , edited by Susan Kenny (South Melbourne: Cengage Learning, 2010). 6. Manohar S. Pawar and David R. Cox, eds., Social Development: Critical Themes and Perspectives (New York: Routledge, 2010), 127. 11. Martin Buber, I and Thou (New York: Simon and Schuster, 1999). 12. Paulo Friere, Pedagogy of the Oppressed (London: penguin Books, 1996). 13. Stan Burkey, Working with People in People First: A Guide to Self-Reliant, Participatory Rural Development (London: Zed Books, 1996). 14. A Kelly and I Burkett, People Centred Development: Building the People Centred Approach – Dialogue for Community Engagement (Brisbane: The Centre for Social Response, Australia, 2008). 15 . Peter Westoby and John Owen, The sociality and geometry of community development practice , Community Development Journal 45, no.1 (2010): 65, doi: 10.1093/cdj/bsp005. 16. A Kelly, A Morgan, and D Coghlan, People Working Together – traditions and best practice (Moorooka: Boolarong Press 1997), 145. 17. Peter Westoby and John Owen, The sociality and geometry of community development , Community Development Journal 45, no.1 (2010): 62. 18. R Atkinson and P Willis, Community capacity-building: A practical guide . (Hobart: University of Tasmania, Housing and Community Research Unit 2006).